The Long Road To Addis Ababa | Hujambo! I am now sitting in a cyber cafe in Nazareth. This is the first time I’ve used a computer in over two weeks. The Internet has been down in all of Ethiopia due to some cable in the Mediterranean. We came here looking to make an international call to Ellinor’s parents and surprise, there’s Internet! Ethiopia is much different than the other African countries I’ve visited. As I understand it, other than a short-lived Italian occupation in the 1930s, they were never colonized. I guess that explains why they still use Amharic as a national language and have such a rich culture — food, language, music, and dress are all very unique. Strangely they do say “ciao” sometimes, and they love coffee. I know Ethiopia is the “birthplace” of the coffee plant, but these people love both macchiatos in small cups and pasta. There are coffee shops everywhere (even the small towns), which is really nice compared to Kenya, where you can only get a nice cup of coffee in the two or three upper-class coffee shops in Nairobi. Ellinor and I left Nairobi on December 29th. The bus took twenty-eight hours to reach the border of Ethiopia. The road was pretty bad, but not as terrible as everyone makes it sound. I think it’s the time that makes it so bad. We had to hire armed guards after a little town in the middle of Northern Kenya’s nowhere (I think the town was called Turbo, just past Marsabit). We didn’t have any incidents, but it is crazy to think that armed guards are necessary. 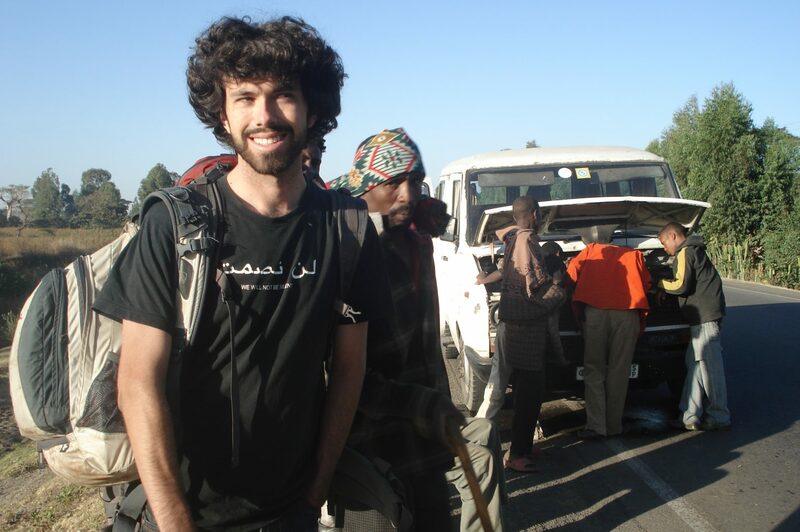 We arrived late at night in Moyale (the Kenyan side) And booked a room with some people we met on the bus. Ellinor bunked with two Israeli girls and I shared a room with two Somali guys, Alas and Mohamad Ali. The next day we crossed over the border and changed our Kenyan Shillings into Ethiopian Birr with no hassle. By the time we found our way to the bus station the buses North had all left, so we called our new Somali friends and they said they missed the bus too, so we could come and stay with them. Cool! This was now New Year’s eve, which was spent discussing Somali politics and Islam. We were in bed by eleven o’clock. Happy New Year! 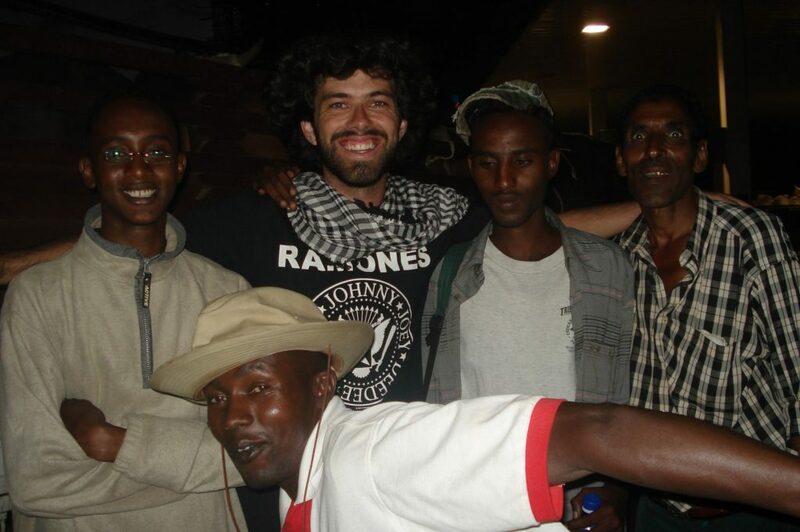 On New Year’s day we boarded a bus with hopes of sleeping in Shashamane, the somewhat holy city for the Rastafari. It turns out our bus had a cracked windshield which forced us to drive ridiculously slow. Public transport vehicles in Ethiopia are apparently not allowed to travel at night (good rule! ), so after fifteen hours of driving we stopped in Awassa to sleep. We walked around town with some of our bus buddies drinking coffee and eating Ethiopian food. Shashamane was interesting, but was kind of a chore to reach because two of our buses broke down there (one on the way and one leaving, ugh!). I guess it’s probably cooler if you are into the whole Haile-Selassie-as-Jesus-reincarnate (Rastafari) thing which is not unrelated to the Marcus Garvey “Back to Africa” movement. We visited some guy from the Caribbean who makes art using banana leaves. No dyes or artificial stuff. Pretty cool actually. I bought some cards and some of you may get one in the mail soon. Cross your fingers ;). Yesterday we were in Sodere, about two and a half hours from Addis Ababa. We had heard there was a nice hot spring so we figured we’d go spend the day bathing and the night walking around the town — a nice plan but when the bus stopped we were in the middle of nowhere at a resort full of white people. The hot springs were pretty hot but luckily not so smelly. A French guy gave us a ride from Sodere to Debre Sade where he and his wife gave us a tour and took us to lunch (thanks!). It turns out he was a retired general from the French army. He was a good guy and pretty funny. So tomorrow we head to Harar, where I’ve heard there are over 100 mosques — it’s apparently the fourth-holiest city in Islam. I think I read once there are a lot of hyenas there too. Should be interesting. We’ll be there for Ethiopia’s Christmas (January 7th). y the way, Ethiopia’s calendar is seven years and 113 days behind ours and their clock is six hours ahead so we always have to ask, “European or Ethiopian?” when people give us times. So adios for now. I will have pictures when I get back to Kenya! I was going to say, I just learned that Ethiopia’s calendar is 7 years and 113 days behind ours and their clock is 6 hours ahead. Please send a banana leaf card to Alaska!! Pllllleeeease! I’m a Kenyan and we do have horses. In Kenya, luos are crazy abt Obama. Sure, there is 1 horse that walks around giving rides to kids in posh neighborhoods. But generally speaking there aren’t many horses in Kenya. Yes, it’s obvious Kenyan Luos like Obama. I was not expecting Ethiopians to be proud as well.